A day for a drive, that's what today started out as. 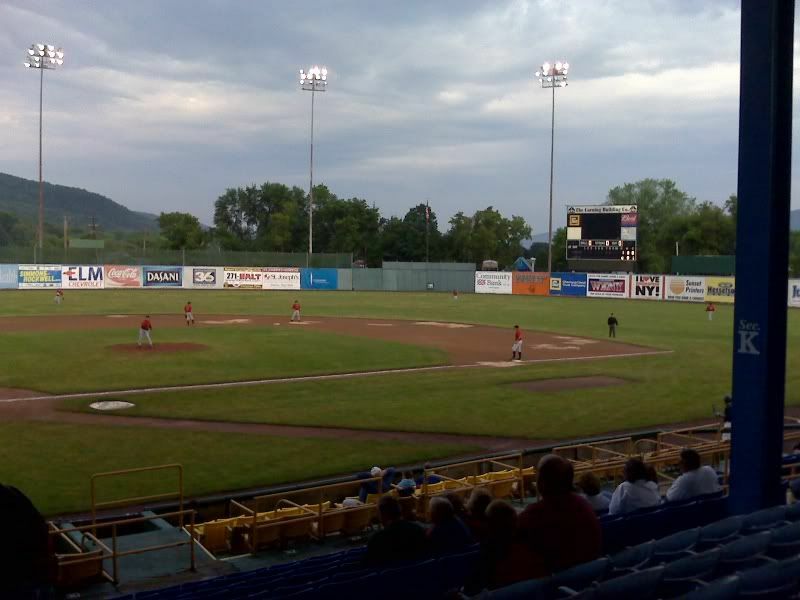 After bombing around Binghamton for a while, and realizing there really wasn't anything to do, we headed west with an Elmira Pioneers game at Dunn Field in mind. Our first stop was at the Arnot Mall in Horseheads to do some shopping before going back to Luce Street in Elmira and Dunn Field. Wow. That was pretty much the first impression that Jill and I both had as we pulled into a parking spot near the grandstand area. That's not a good, enthusiastic wow either. It's the kind of wow that kind of feels like a sock in the gut. It had been around 16 years since my last trip to Dunn Field, and this was Jill’s first. It’s amazing what can happen to an old ballpark when the powers that be charged with its upkeep just stop caring, or having the tax dollars to properly care for a place. As we parked, the rust that had overtaken the underside of the grandstand was clearly visible. The light stantions took on the same hue, and it looked as though neither had seen a fresh coat of paint in over a decade – not good for any metal structure exposed in the harsh northeast winters. I couldn’t believe how poor the stadium looked as opposed to my last visit, and I was actually a bit embarrassed because I had really talked the place up to Jill for quite a while. ‘Classic ballpark’, ‘lots of history’, ‘great place to watch a game’. All sayings that I had used to describe Dunn Field, and all of which were replaced by my dropped jaw and ‘wow’. 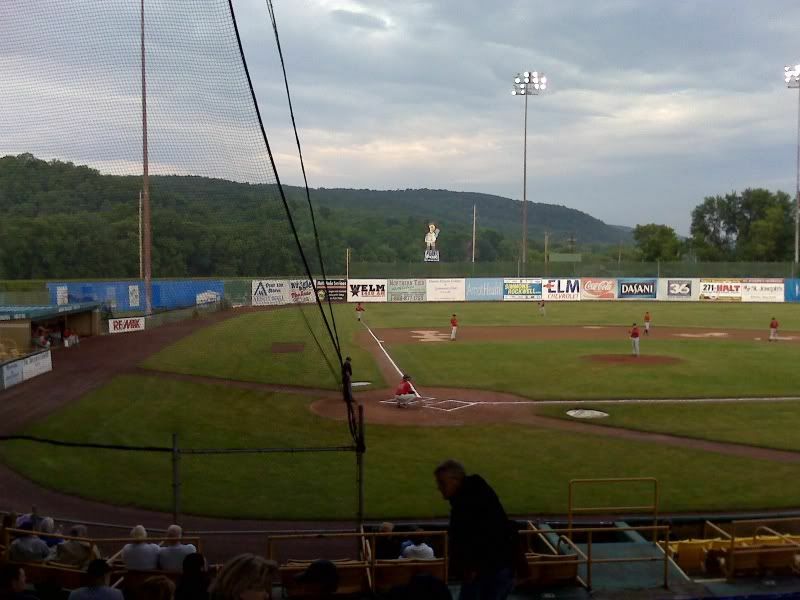 We actually had thoughts of leaving the ballpark and heading for the races in Chemung instead, but decided against it since we had been trying to get to Elmira for a game and, well, here we were. The lone ticket booth was just inside of the main gate, which was positioned under the large brick façade out front. It was obvious at this point that this was a true mom and pop run team. ‘Son’ was working the box office, ‘mom’ was working the concession stand, and ‘dad’ had charge of the souvenir stand (which was stocked with generic looking embroidered t-shirts and hats, a few baseballs, and some jersey’s from the Johnstown Johnnies). I knew this was the makeup of the staff when I handed the son a $20 bill for our general admission seats (which were a bargain at $3.00 a piece!) and he had to ask mom for change from the concession stand because he didn’t have enough money in his till to give me change. An interesting and knowing look was exchanged between Jill and I at this point, something like ‘wow’. The concession stand, where we found mom, had a fair share of stuff to eat and, bonus, beer both in cans and draft. Only half of the concession stand was actually open, and the concession stand that used to exist at the top of the seating area was shuttered up. The prices at the concession stand were pretty high, but I’d be willing to bet they had to make up their overall shortfall somewhere (later in the game, I heard mom and pop having a conversation across the walkway from the concession to souvenir stand where pop told mom they didn’t even break even for this game). We paid $2.25 for a small piece of pizza, and the hot dogs were over $2.00 as well. 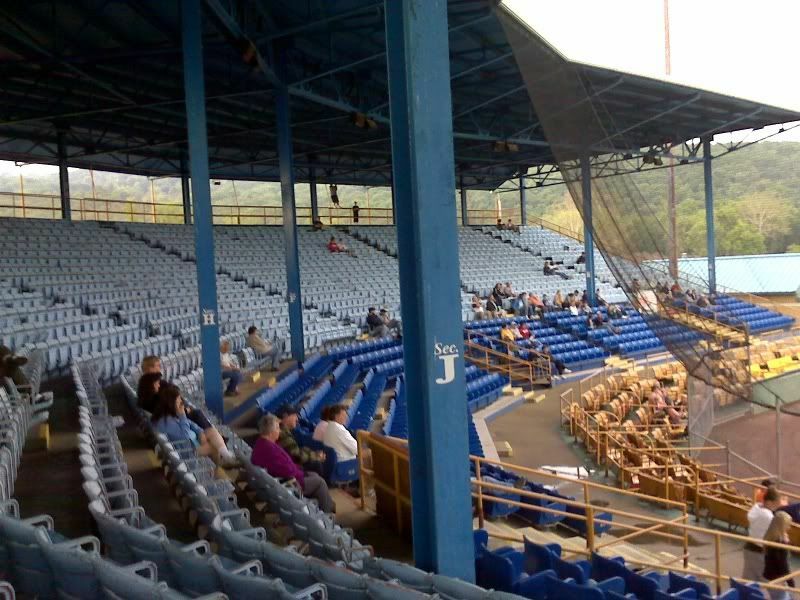 The seating area looked as it always has, but very much like the grandstand and light poles, the seats hadn’t seen a fresh coat of paint since the NY-Penn League played its last game here I’d be willing to bet. Most of the scoreboard didn’t work, except for the balls, strikes, and outs, as well as the runs, hits, and errors. At no point during the game could you tell what inning it was, nor did the public address announcer find it necessary to keep us up to date with the current inning number either. The outfield wall had ads from foul line to foul line, but again many of them looked as if they had been there a very long time – many were faded and weathered, and I’m sure the Homer Simpson billboard was there in the early 90’s. There were no in between inning contests, no giveaways, no 50/50’s. The music that they played was old, almost as if (surprise) it was leftover from the NY-Penn days. I mean, when was the last time you heard the ‘Curly Shuffle’ at a ballpark?? As for the play on the field, Bolivar was clearly outmatched by Elmira. The score ended up being 15-2, and I think when we left it was 11-2 or something like that. I’d tell you what inning we left in, but I really don’t know. Overall, our first stadium visit to Dunn Field could very well be our last. I’m sure I wouldn’t bug Jill to go back anytime soon, and without some assistance I don’t think the Elmira Pioneers of the NYCBL is long for its existence either. The Elmira Pioneers pounded out 21 .hits en route to a 15-2 rout of the Bolivar A's in New York Collegiate Baseball League play Saturday night at Dunn Field. Chris Spatkowski went 4-for-6 with two RBIs for Elmira, which had eight of its starters get at least one hit. Michael Mergenthaler came a home run shy of hitting for the cycle, going 3-for-5 with three RBIs and two runs scored. Casey Brett and Ryan Riley also had three hits apiece, with Brett scoring twice and Riley hitting a triple and scoring three times. Ryan Price went 2-for-3 for Elmira, which drew an announced crowd of 237. Pioneers starter Bryce Jenney struck out 11 in six innings. He allowed just one run, and it was unearned, as he gave up four hits and walked two.